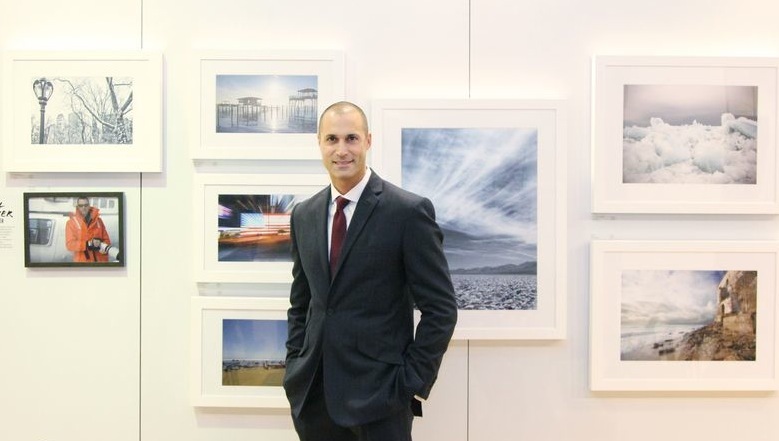 Art Crasher is excited to be kicking off our gallery tour tonight,February 7, 2014 in San Francisco. We invite fellow artists and art lovers to join us at SOMArts’ Bay Gallery from 7:30pm-11:30pm. This will be the first of four US shows. The tour will continue in Los Angeles, Chicago and New York City. Come out and enjoy work from 80 international artists from 12 countries. We will also have San Francisco's own Pete Doolittle painting live at the show from 8:00pm-11:00pm. 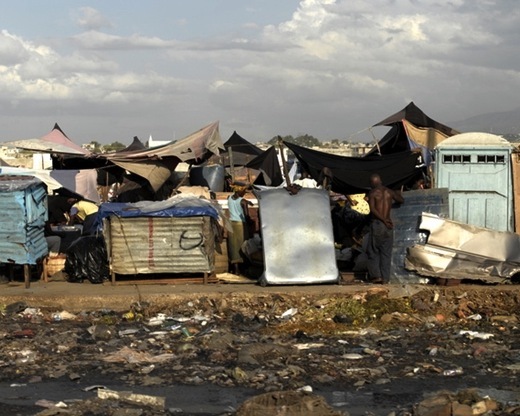 We are also very excited to announce our partnership with UrbanSitter. Whether you’re heading to one of our gallery shows, going for dinner or need to run errands, UrbanSitter is your online resource to find an occasional sitter, last minute help or full-time nanny. UrbanSitter is generously sponsoring each of our tour dates. We’d like to take the time to share a word from UrbanSitter’s Community Manager, Molli Hoos. “UrbanSitter is excited to sponsor ArtCrasher's first Art Tour show! As part of our effort to help make the show a success, we are offering a $15 discount to book a sitter on Friday night. To redeem, simply create a free profile at (>>>) urbansitter.com and enter code ARTCRASHERS15 on the Credits page under My Account -urbansitter.com/parent/credits. Not familiar with UrbanSitter? We are an online resource that connects parents with great babysitters. A local start-up founded right here in San Francisco by 4 busy parents, UrbanSitter helps you find available sitters recommended by your friends or parents in your social circles - so you can feel secure in hiring someone you trust. Simply search sitters calendars, select based on reviews and credentials, then book and even pay right online! See you on tour, Art Crashers! 31 days have come and gone. 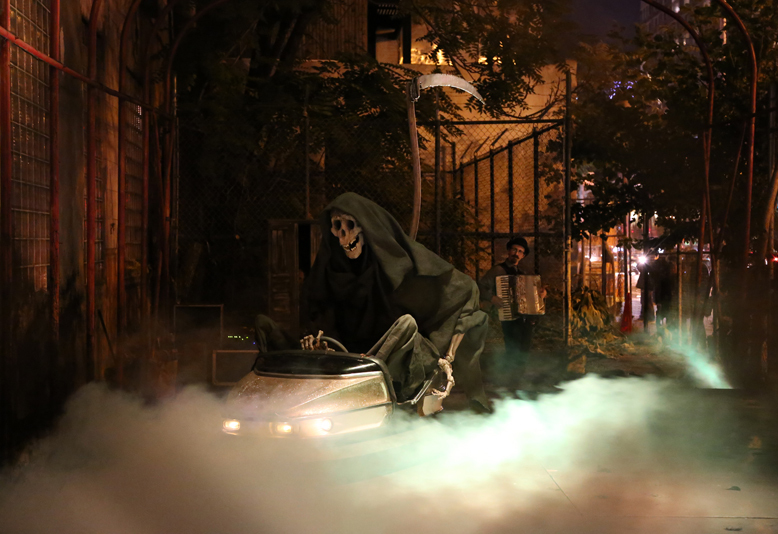 Banksy's NYC residency is officially over.Banksy left us with a few treats on this Halloween day. 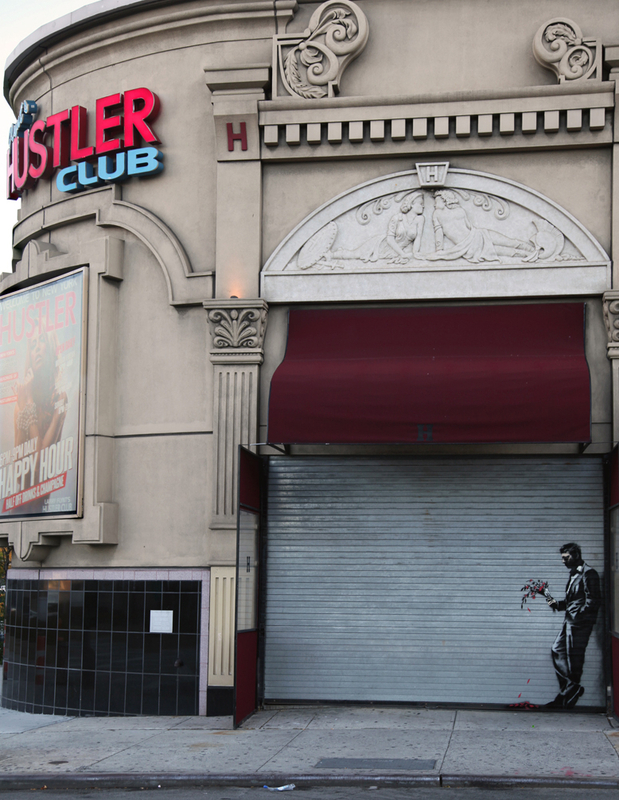 Banksy, you will be missed. I don't have much to say to introduce this blog post this morning because I'm speechless. I just about fell off my chair when I read this, this morning. 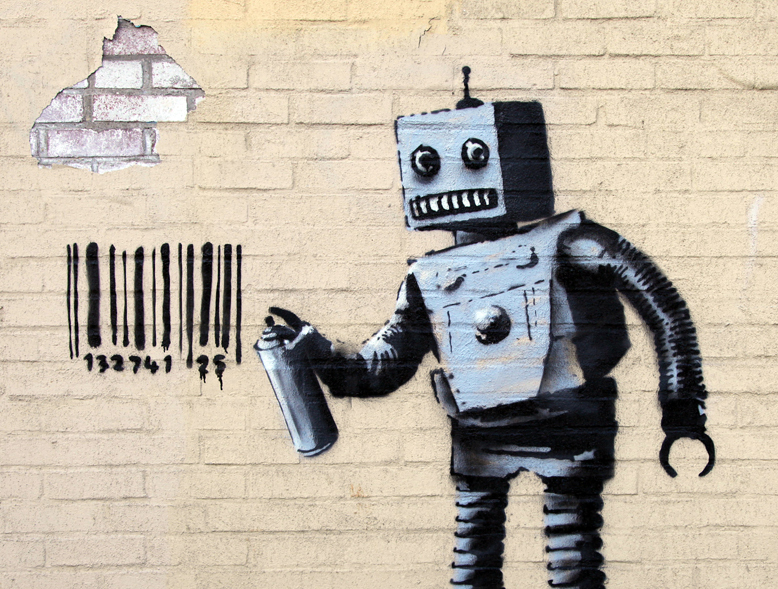 Banksy posted his daily piece today accompanied by an article he wrote. Today’s piece was going "to be an op-ed column in the New York Times." 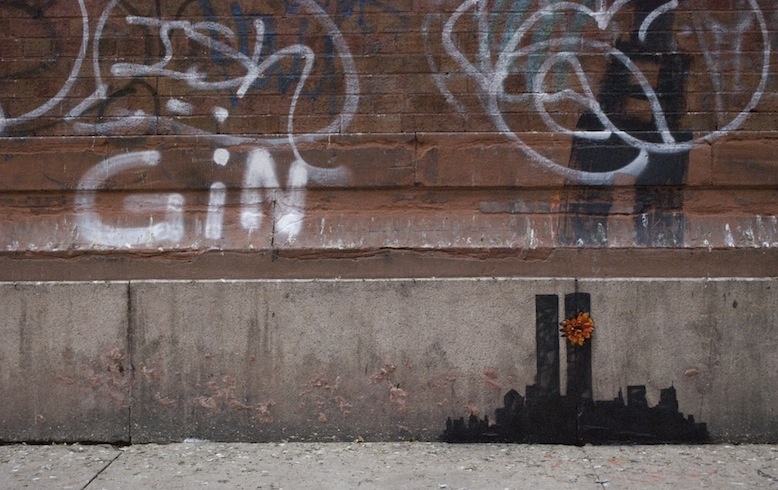 The New York Times refused to publish Banksy's column today. It's no surprise the column was canned. As a newly minted American, I have learned over the years there are some topics you just don't bring up in a negative light. One of those topics is 9/11. 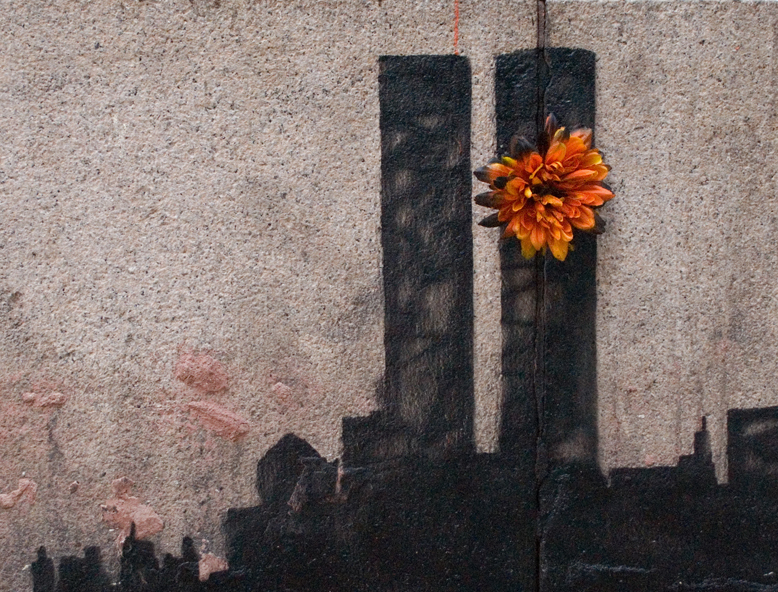 9/11 for the US is a wound that is still slowly healing. That wound is like an angry bear. If you wouldn't poke an angry bear, you also shouldn't reopen a wound. I'm all for freedom of speech, but as someone who has family in NYC, this piece hit a nerve. Miss a day, miss a lot. My Aussie friend, Bec, just arrived in California yesterday. 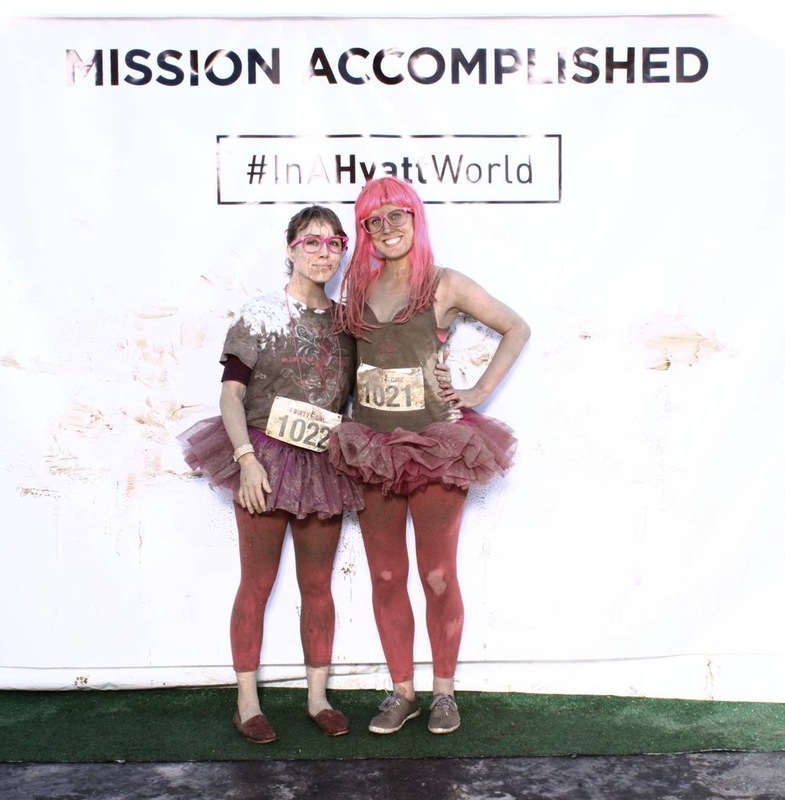 Today we ran the "Dirty Girl" Marathon-aka 5k run through the mud in costume. San Francisco is a huge dressup city and Bec came ready with pink wig in tow! She is my traveling partner in crime. We met while bartending in college in Canada.Before I knew it,we were traveling together to Cuba, France, England, and North Africa. We reunited yesterday for the first time in 3 years. Had to throw this in for a laugh.Post mud race. Its hard to smile when the sun is in your eyes and there is mud in your mouth, but what a great laugh and a great time. After temporarily shutting down his show due to "police activity", Banksy's work showed up in Hell's Kitchen today. We're happy to see the NYPD hasn't been successful in their quest to take him down. Another day, another Banksy. 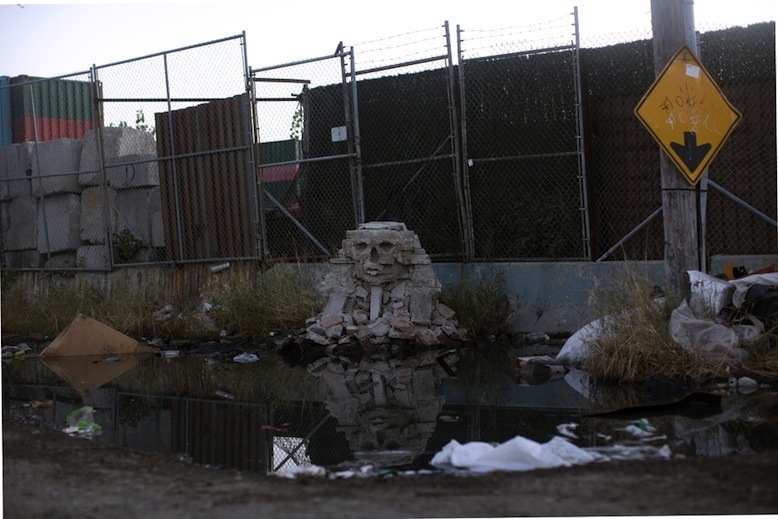 Banksy made a "1/36 scale replica of the great Sphinx of Giza made from smashed cinderblocks." Its nice to see Banksy venture out from his usual art form. 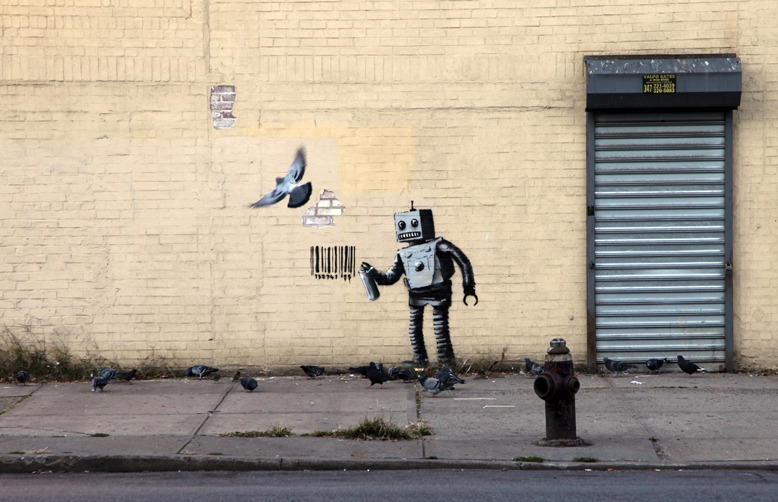 Another day,another Banksy.Today this piece showed up in South Bronx. 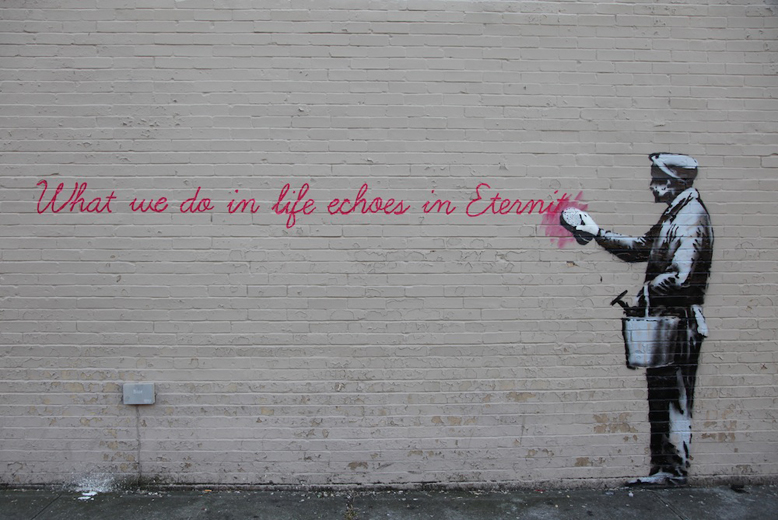 Another day,another Banksy.Banksy hits the Upper West Side as his month long residency in NYC continues. It seems McDonald's in New York City will have a new featured item that won't be found on the menu. 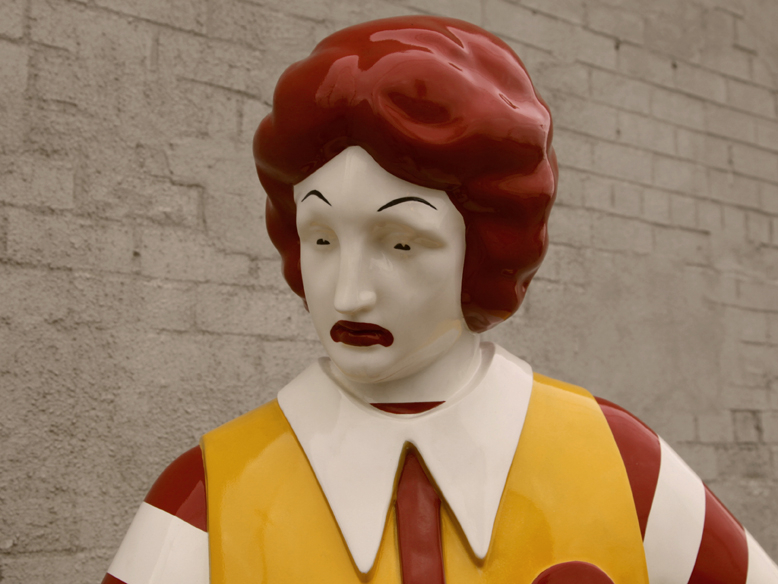 This sculpture "will visit the sidewalk outside a different McDonalds every lunchtime for the next week." A nicer reminder of the grade E meat being served...Yum! After a nearly 6 hour flight back to California, I was happy to be reunited with my 7 month old pup. I already miss the big city. As I walked off the plane, my email chimed and new Banksy work appeared on my iPad. This piece needs no introduction. It reminds us of something we already know, the NYC skyline is forever changed. 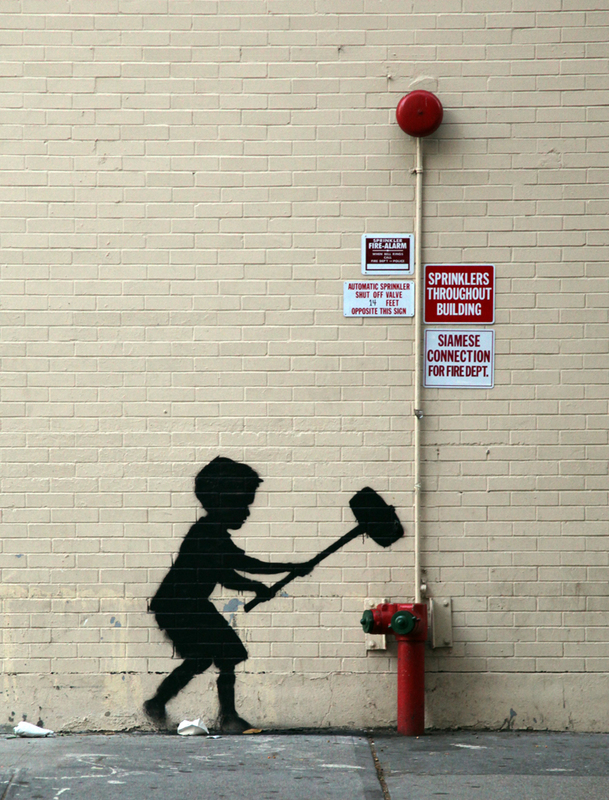 If you criticize Banksy, be prepared. He has no problem throwing some...Kelly Rowland quotes your way? Banksy shares "Some people criticize me for using sources that are a bit low brow (this quote is from 'Gladiator') but you know what? "I'm just going to use that hostility to make me stronger, not weaker" as Kelly Rowland said on the X Factor." There, you've been told. 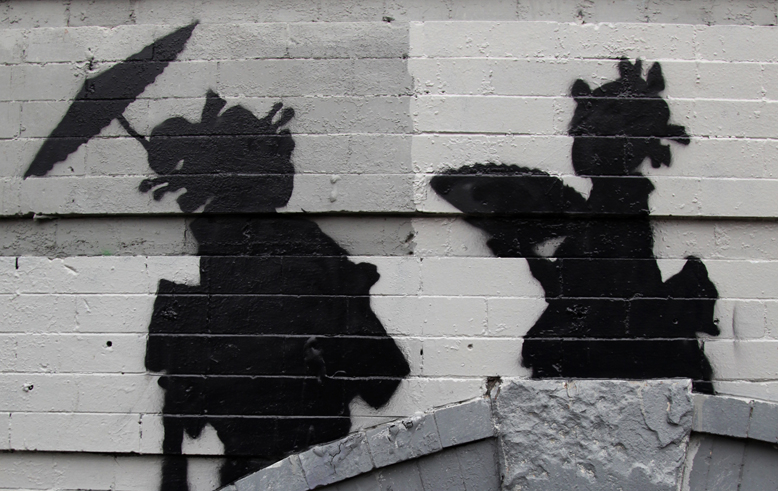 Banksy Sets Up Shop in Central Park, Does Anyone Notice? Banksy set up shop in Central Park yesterday. 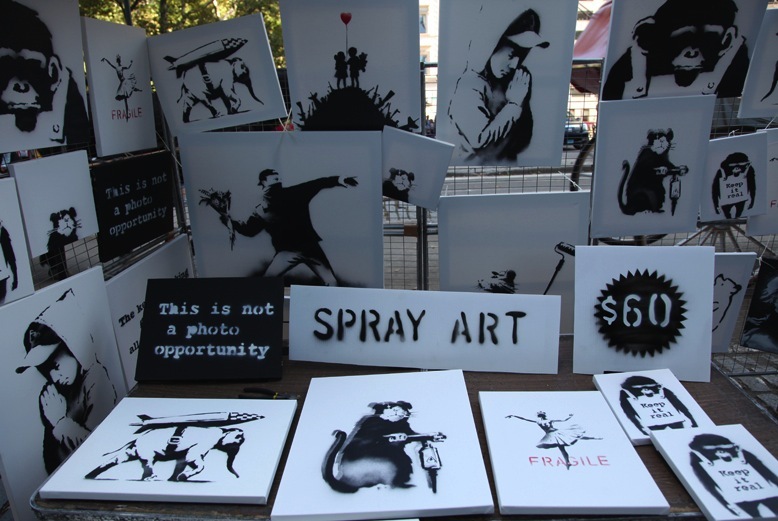 Authentic, signed, Banksy pieces were selling for $60 each. Pedestrians in NYC are constantly hounded on the street for a buck. You eventually learn to tune out sellers and have tunnel vision to reach your destination. The shop was set up from 11am-6pm. 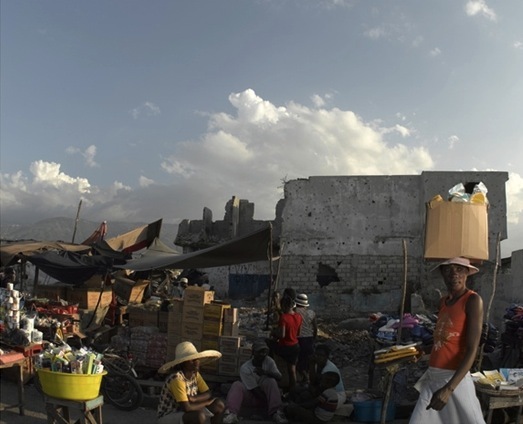 Between those hours, only lucky seven pedestrians stopped to buy his work. 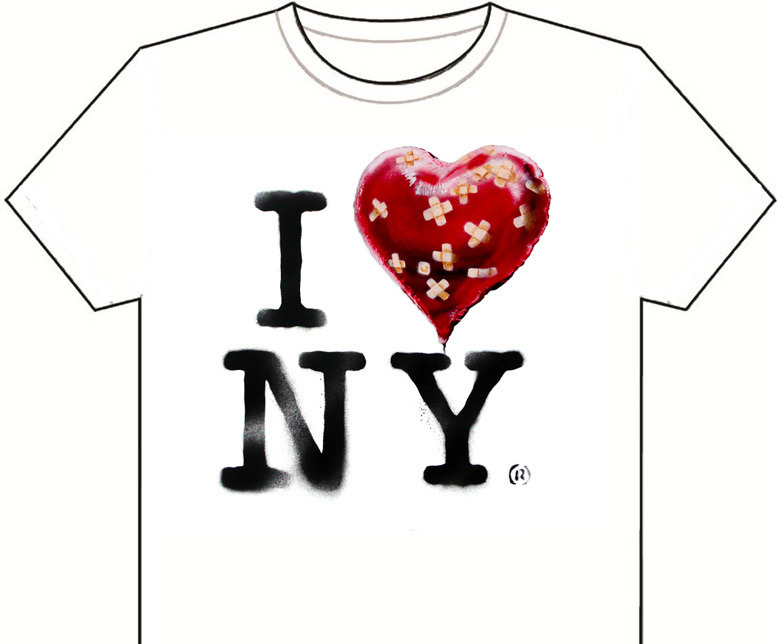 I say "lucky" because Banksy's work typically goes for a pretty penny. His piece “Bombing Middle England" was sold in 2007 for $200,000 at auction alone. I think its fair to say some buyers were oblivious as to what they were actually buying. A new homeowner from Chicago bought four pieces,saying "I just need something for the walls." I'm sure those pieces won't be coming off his walls anytime soon. I have a few things to get off my chest, maybe this confessional will do me some good. Another day, another...slaughterhouse delivery truck? Banksy has sent out this truck to the Meatpacking District. Shall we say "The Muppets" meets "Silence of the Lambs" ?